LFP SMZ REVIEW | Fauna and Flora Research Collective Inc. This has not been the Department’s position stated or acted on in numerous Long-footed Potoroo detections (see these 40 reports and this review) which has necessitated extensive work by the FFRC to try and achieve this and other key minimum protections for the detection site locations of Long-footed Potoroos throughout their distributional range in East Gippsland. 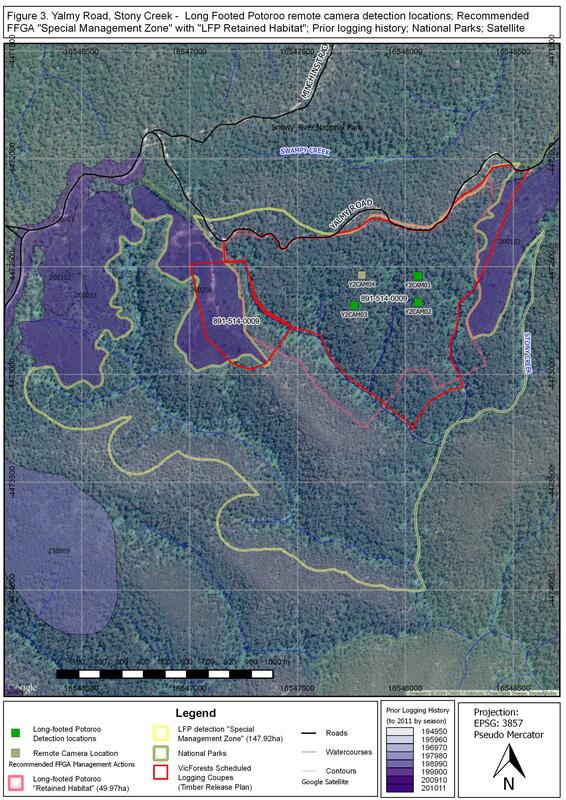 Further, beyond not requiring the inclusion of detection site locations in LFP management actions, the Department has left the design of these protection zones up to the logging agency VicForests and has facilitated the adoption of woefully inadequate management zones that have little prospect of providing any meaningful protection for this endangered species. If the Department now wishes to change this policy and procedure the FFRC would welcome this development and point the Department to the numerous reports of LFP detections which are still under threat from logging and requiring of appropriate adaptive management actions. The FFRC’s reports can be found HERE. The Fauna and Flora Research Collective Inc. (“FFRC”) have been involved in the detection of the LFP and involved in corresponding on the appropriateness of responsive forest management planning for at least the 37 locations (which are considered within this report) in State Forests within scheduled logging coupes from 2009 to the present. The details of each of these detections were contained in 27 survey reports and letters submitted to the Department of Sustainability and Environment (“DSE”), now the DEPI and collectively herein “the Department”, and VicForests. The Department has confirmed as “verified” detections and created Special Management Zones (“SMZ”) for almost all of these detections (see below). The Department’s online interactive mapping program Biodiversity Interactive Maps (“BIM”) shows that all of these detections minus 4 (the “Brown Mountain”, “Little Yalmy River Survey #2”, “Black Cuttings Track [skull detection]” and “Yalmy Regnans” detections) are now contained within some form of Special Management Zone (“SMZ”) designated as a consequence of these detections within State Forest. The continued debate over the quality and appropriateness of the design, approval and spatial arrangement of each of these SMZ’s remains the subject of this letter.